I don’t like what looks to be shaping up as the “new normal” either. I’m not an economist and doubt any of you guys believe in this stuff anymore, but I’m of the seat-of-the-pants school of thought that believes if you spend your way into oblivion that you will go broke. With millions of long term unemployed and underemployed that makes keeping long-term debt under control more difficult. However, some positive debt news from 2011 is that in the the first 3 quarters of 2011 GDP% growth was higher than publicly held debt% growth (5.7% to 4.7%) according to my Krugman-mimicking, back-of-the-envelope calculation. And that is with 6 million fewer wage earners out there. That is a far cry better than the 43% percent growth rate of debt held by the public since early 2009! The debt-to-GDP ratio, though inching up, still remains a manageable 73% or so if I did the math right using 2005 adjusted “Debt Held by the Public” dollars and eyeballing the chart above. LOL!!! While reviewing BLS employment figures since 1992 I noticed the Tim Duy “dip” in there to. It makes sense… fewer workers, fewer paychecks, lower GDP. 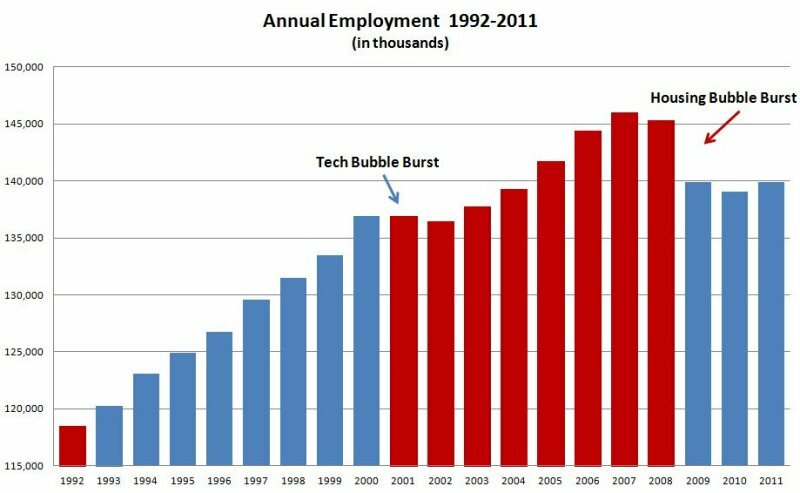 I also noticed, because of the employment-GDP link, that there should be a permanent “Duy Dip” in 2001, too, resulting from the tech bubble collapse. In fact, there is one. Its in the GDP data. Its just that its a lot smaller and a lot harder to see in there than it is in the housing collapse data. It was a lot smaller recession. It appears the “Duy Dip” became a permanent feature after the 2001 recession so will become a permanent feature of this one to!